Zafran at Mirdif City Centre is an Indian restaurant we like to frequent for their creative and delicious dishes which remind of us of home. 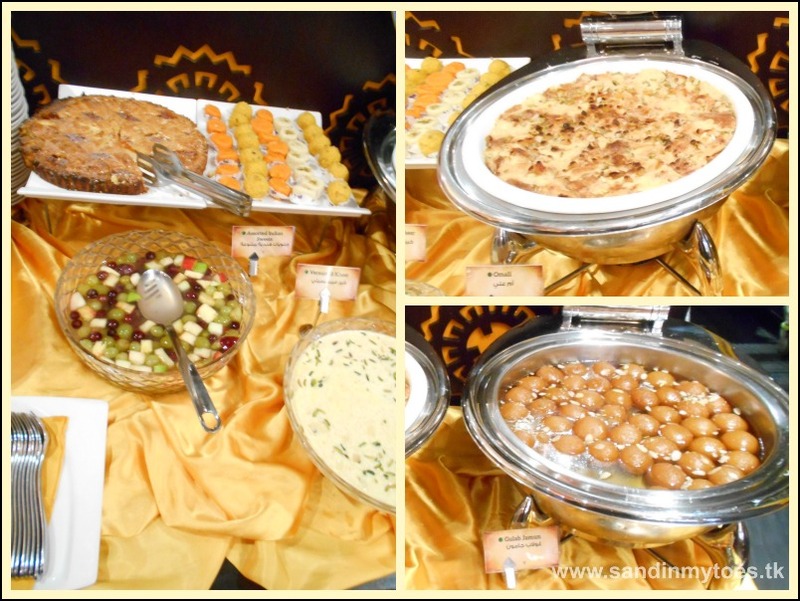 We had never visited them for Iftar, though, and it was a pleasure to be invited to try their Ramadan menu recently. It was a Fiday when we stopped by, and it was quite busy as it was close to Iftar time. The set menu here is served in a buffet. We were welcomed with some Strawberry Lemonade. To start off, there was a variety of salads, including some in Indian chaat style, such as the Chana Chaat (spiced chickpea salad). 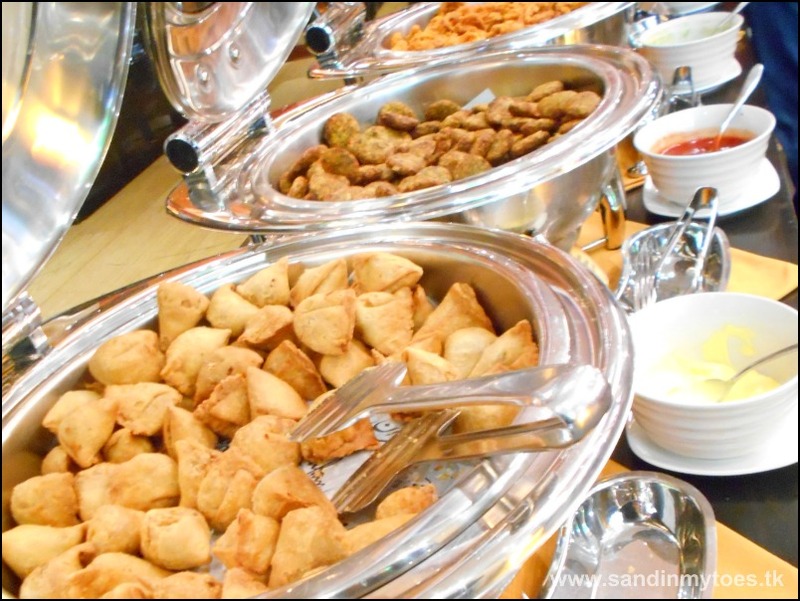 Pakoras and samosas are staples at Iftar in India, and we were glad to see Vegetable Samosas and Seafood Pakoras (fritters). These went well with green cilantro chutney, although there were many condiments offered. 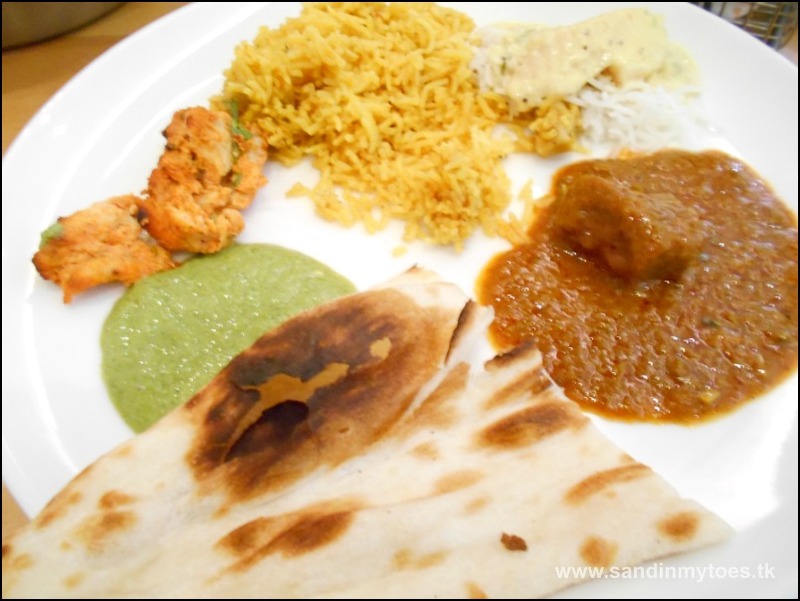 We also loved the tender Tandoori Murgh (similar to chicken tikka), and the Shammi Kebab (meat cutlets). The Chicken Biryani was fragrant and not too spicy, and tasted as authentic as the one made in my Mom's kitchen! Their Lamb Masala is one of my favourite dishes, and it was nice to see this dish served during Iftar as well. This succulent lamb curry is perfect with Butter Naan which was being served at every table. If you like things milder, the Coconut Fish Curry was subtly spiced and tasted great paired with white steamed rice. For Little Dude, we ordered separately from their Children's Menu. It was great that they offered us this choice, as he couldn't find anything he liked on the buffet. 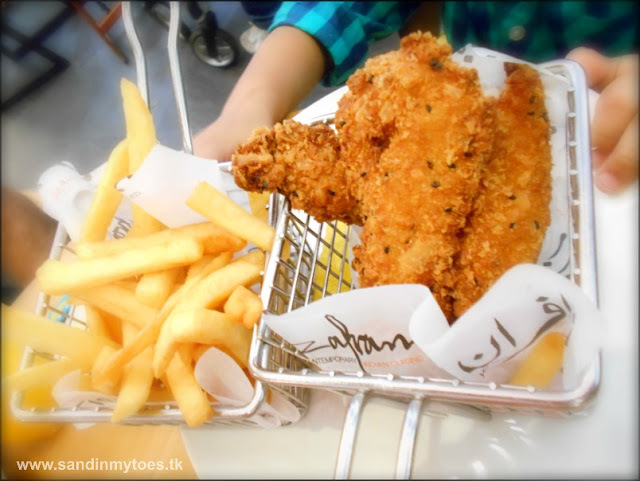 He had their Fish and Chips, which was served with saffron mayonnaise and ketchup. His meal included fresh juice, and ice cream for dessert. We also ordered some beverages from their menu. My husband liked the Jaljeera, a traditional Indian cumin and lemon drink. 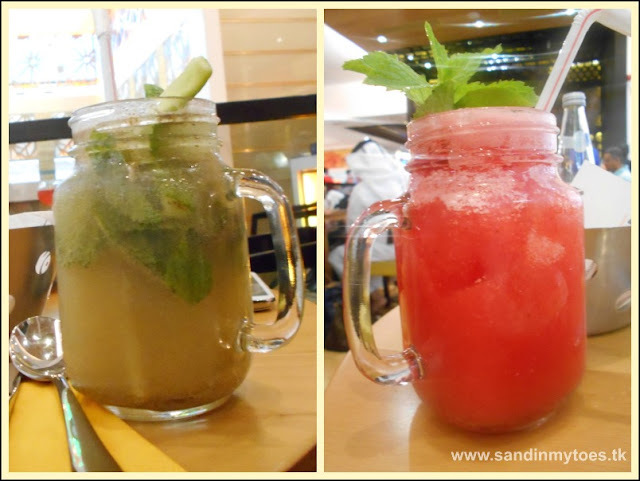 I loved the refreshing taste of the Watermelon & Mint Smash, which had a hint of rose flavour. For dessert, there was fruit salad, Gulab Jamun, Umm Ali with saffron and pistachio, Apple Pie, Kheer, and an assortment of Indian mithai. So, there was a good mix - whatever your taste. The Iftar menu at Zafran, Mirdif City Centre has a good selection of dishes which is perfect for those who love Indian food. 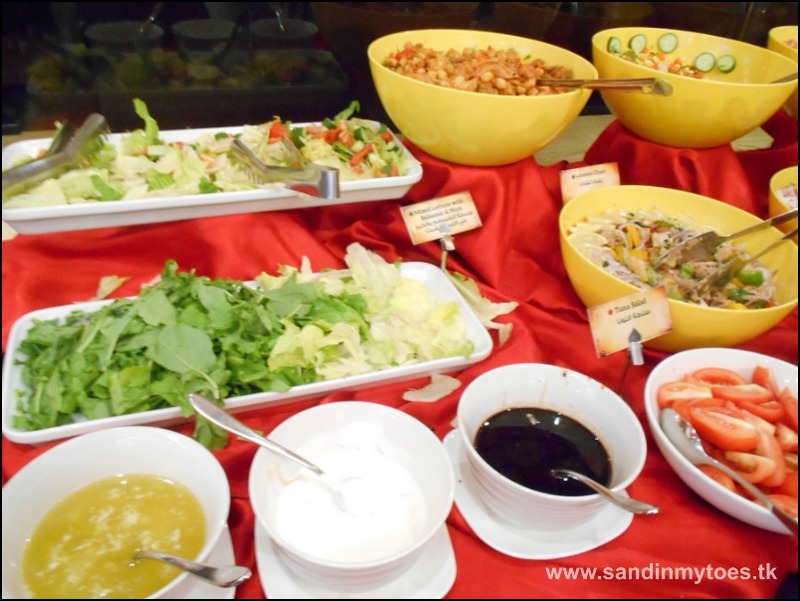 The spices are not overwhelming but just right, and the staff is friendly and welcoming towards families. Iftar here costs AED 99 per person, and is offered from sunset until 9 PM. It is recommended that you make a reservation, as the place can get very busy on weekends. Call them on 04-2840987 for bookings. Zafran also has an outlet at Dubai Marina Mall (with a great view of the Marina), and they serve an Iftar set menu as well (AED 89 per person, or AED 79 for only vegetarian dishes). Call them on 04-3997357 for details. We were invited to the above restaurant for the purpose of review, but all views and opinions are my own.